Retired businessman Thomas McGlone is shot dead during a break-in at his home in Co. Kildare, when several thousand euro he’d just won by betting on racing is stolen. His son Tiernan, a member of the high IQ group Mensa, who works for a firm of stockbrokers, is implicated. This man, his sister and brother-in-law from London have lost their savings in the financial crash. 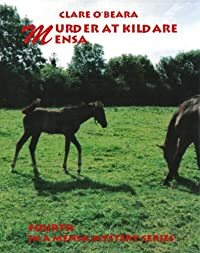 Cara Cassidy, a former showjumper and Chairman of Irish Mensa, agrees to help the family get the deceased man’s racehorse mares to stud. Ricky Norton, her Garda detective friend, forbids her to investigate the death but is covering the case himself, to the displeasure of the Kildare police. Cara’s boyfriend Mike Fraser is running a parachuting event in nearby Clonbullogue and Cara plans to make a charity skydive. But she’s in far more danger on the ground….